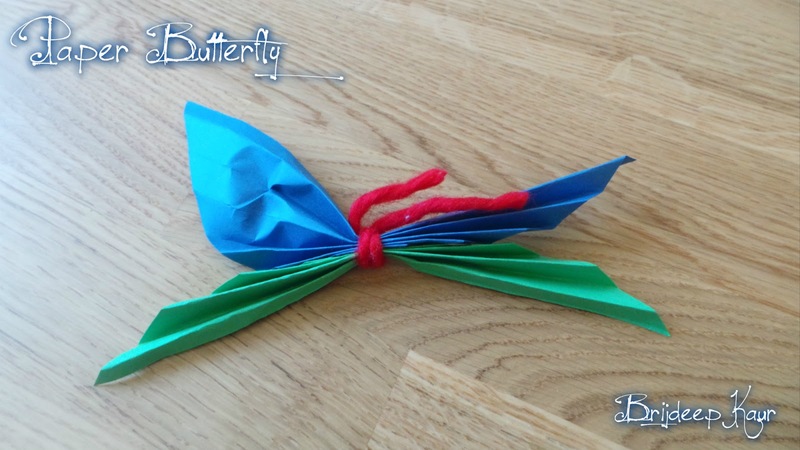 the flower is a tethered butterfly.. I have always been fascinated by butterflies all my life and even as a kid I used to run after butterflies as they attracted me but I never tried to catch them. 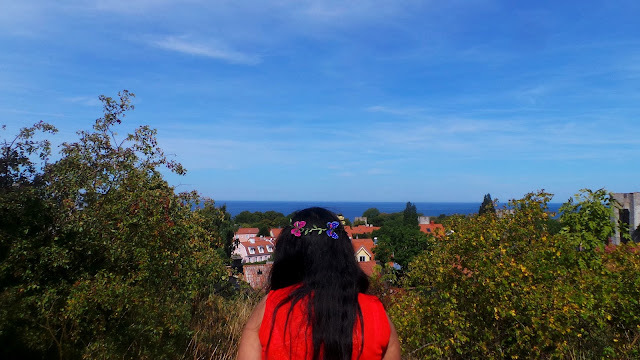 I have had butterflies sitting over the back of my hand, my shoulders and on my feet many times. 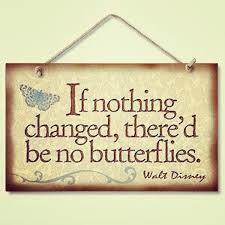 I grew up, but the love for butterflies remain !! I do try wearing some butterfly accessories sometimes in my hair and I'm always looking for more lovelies, with more colors and patterns. 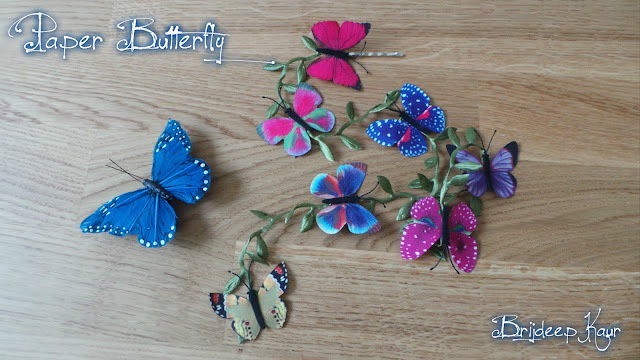 These are the two I wear often and love them: a blue butterfly hair clip and a butterfly wreath. Well, working with kids one needs to grow own fantasy as well. 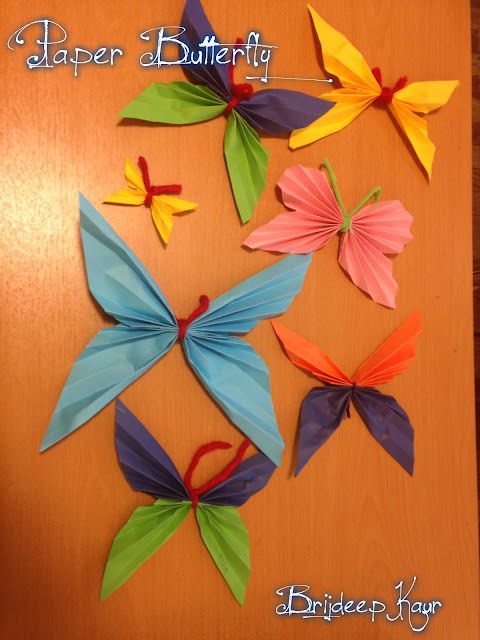 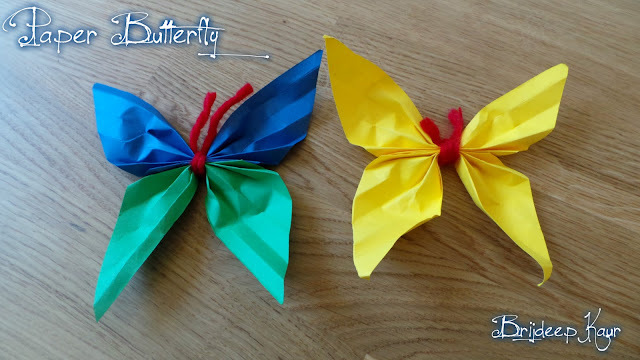 Because of my never-ending love for butterflies, I choose to make butterflies out of paper for pre-school kids. 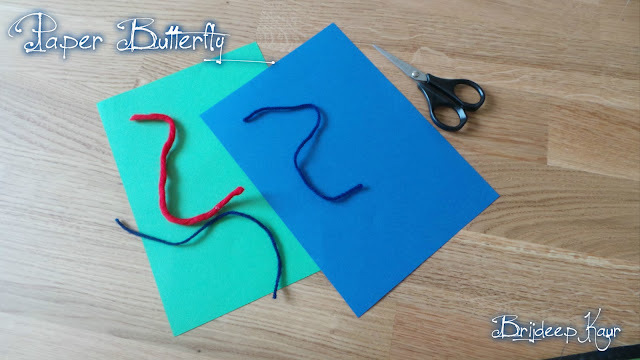 This activity is really easy and fun to do at home, you don't need a lot of materials and it's quick and I'm sure the kids will love it. This can be done with kids of 4-5 years with adult supervision. Fold the paper in a triangle as shown. 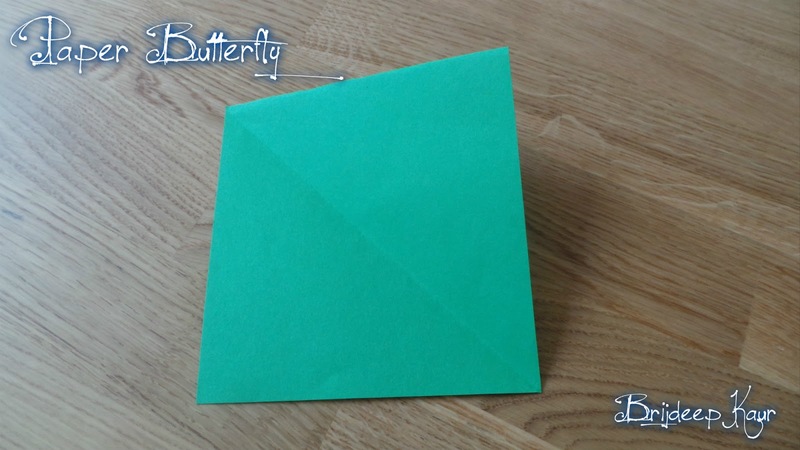 Fold the remaining rectangle as shown in the picture. 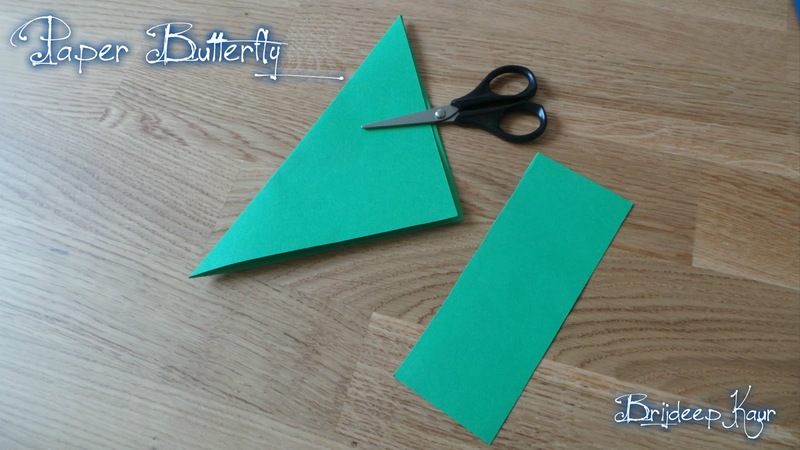 Cut out the rectangle part from the paper and discard it. Now you are remaining with a square with a fold in between. 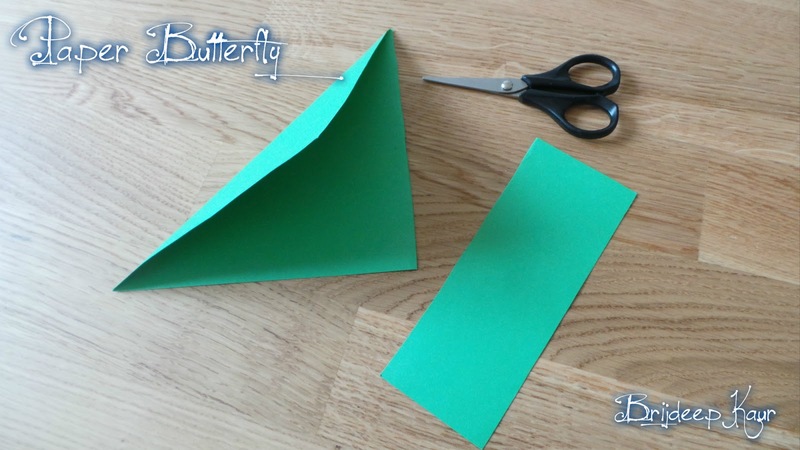 Carefully cut the paper along the fold. 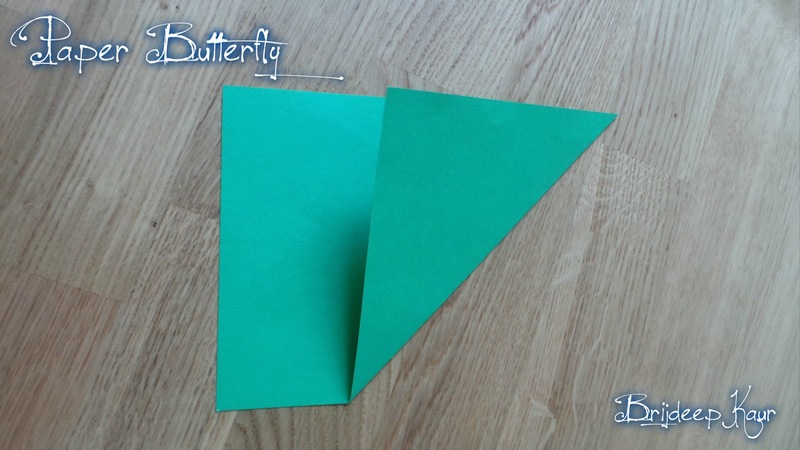 You will get two triangles as shown in the picture. Begin folding one of the triangles in a zig-zag pattern as shown. 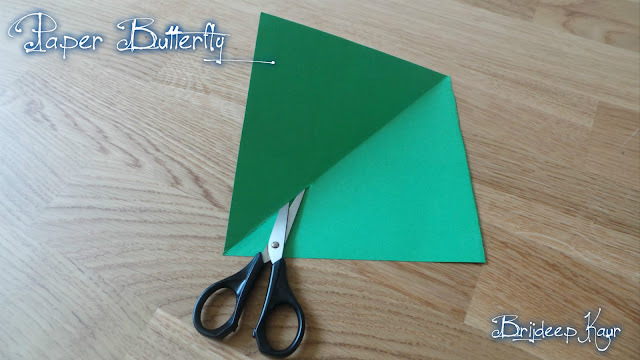 Make sure to use small folds. 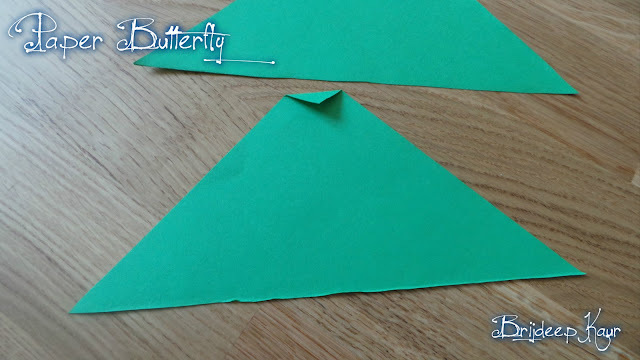 Begin to fold the other triangle too in the same way. 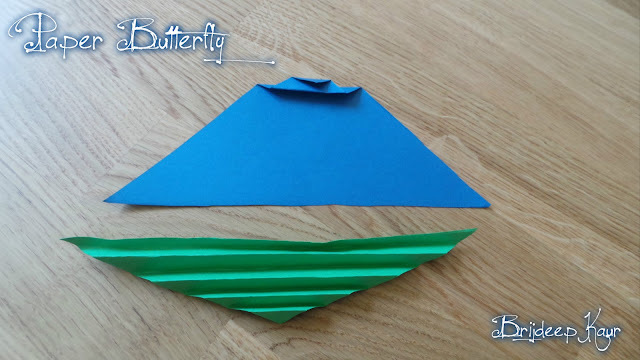 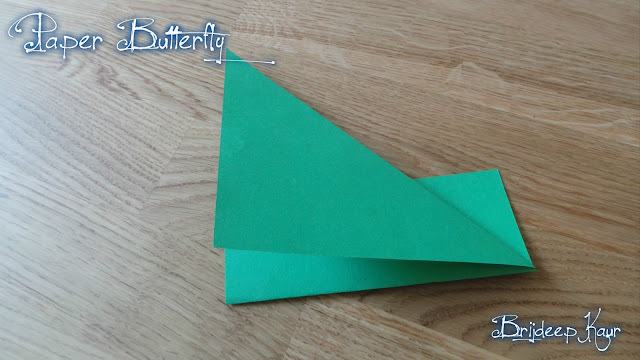 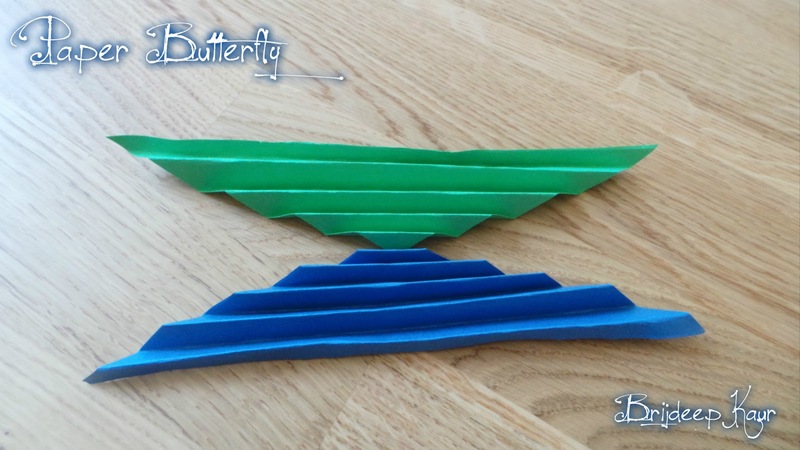 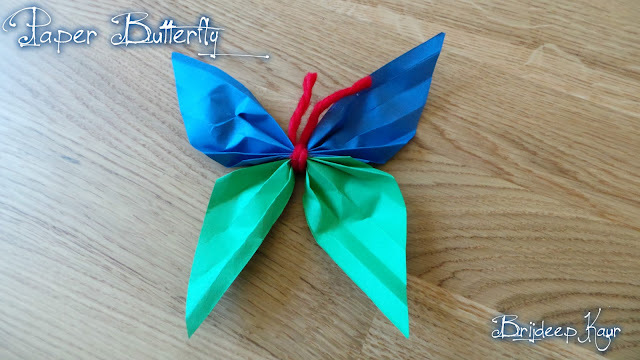 You can use paper of another color for second triangle to make two-colored butterfly. 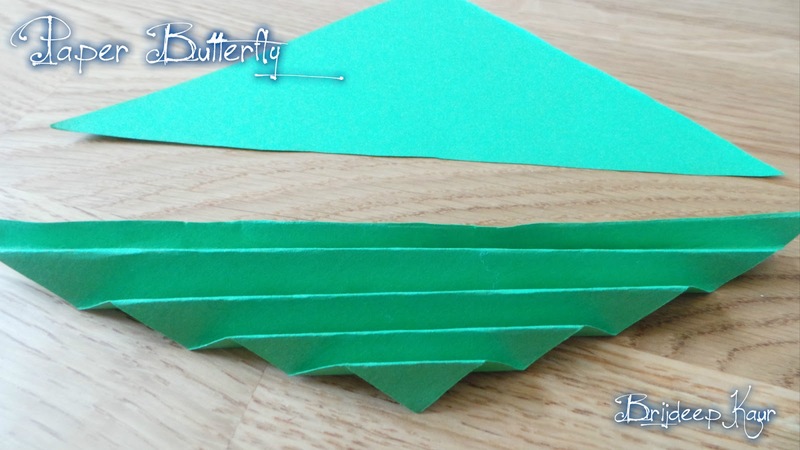 Place both the folded papers with the shorter side together as shown in the picture. 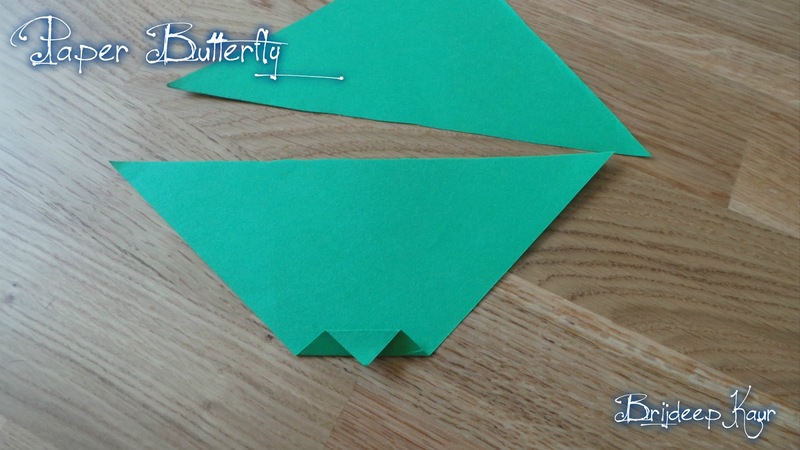 Press together and bind in the center with the thread and make a small knot as shown in the picture. Begin to open and flatten the folded portion from one side as shown in the picture to spread as wings. 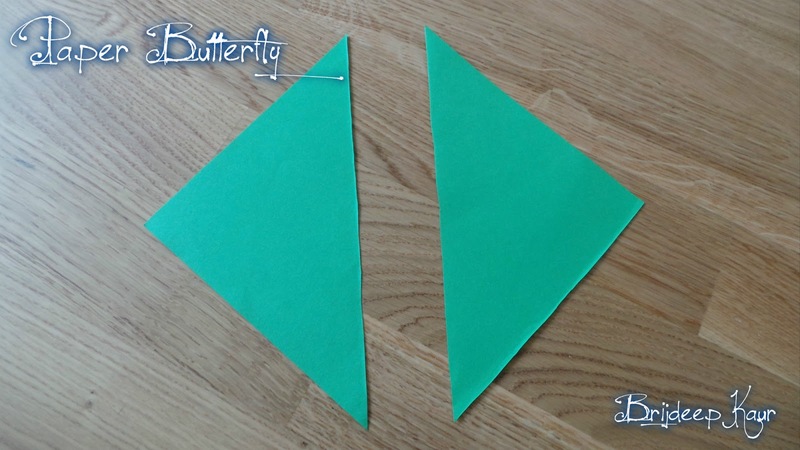 Repeat for all four sides. 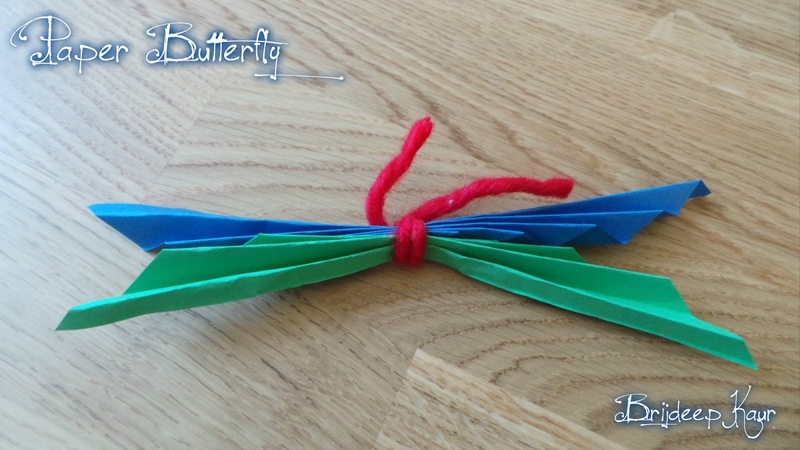 Lovely two-colored butterfly is ready. 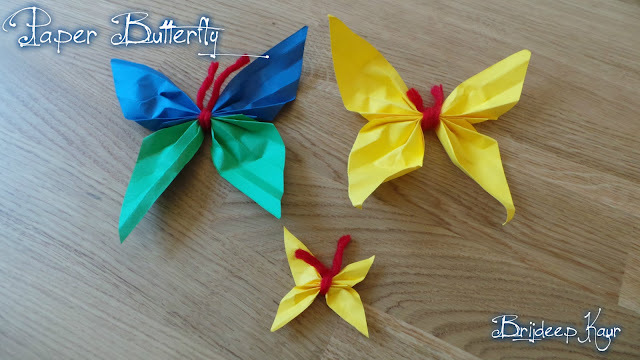 Butterfly can be made in a single color as well.